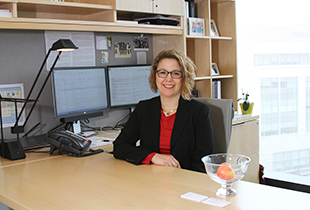 Heather Hageman is the inaugural director of the Center. Her background is in strategic planning, program and outcomes assessment, accreditation, and project management. Hageman has more than 20 years’ experience in medical education, most recently as director for educational planning and program assessment in the Office of Education at Washington University’s School of Medicine. She was also the operations director of the Standardized Patient Center, a resource to health professions programs on the medical campus that provides simulated clinical experiences for learners using individuals trained to portray patient cases in a consistent manner. Hageman is an accomplished presenter both nationally and internationally, board member of the American Interprofessional Health Collaborative, a reviewer for the Journal of Interprofessional Education and Practice, and a member of several organizations including the National Center for Interprofessional Practice and Education and the AAMC Group on Educational Affairs. This national involvement is part of her commitment to sharing best practices across diverse institutions so that everyone can benefit and learn from shared opportunities. Hageman is a certified facilitrainer with NCCJ St. Louis, a 2010 alumna of the Greater Missouri Leadership Challenge, and the recipient of the AAMC’s Central Group on Educational Affairs Laureate Award in 2013. Robin Young joined the Center in January 2018. She is from Toronto, Canada and has a BA in Psychology from Western University and an MA in Psychology from Carleton University. Working in health psychology, neuropsychology and neuroscience research labs, Robin developed an arsenal of skills for developing, coordinating, implementing, and evaluating programs within healthcare settings and the general population. Robin left the higher education setting to implement, support, and evaluate national quality improvement projects with interprofessional healthcare teams at the Canadian Foundation for Healthcare Improvement. Since moving to St. Louis, she helped with administration, database management, and refining standard procedures at Youth In Need and at the St. Louis College of Pharmacy in the Office of Experiential Education.